But why does it seem to point right towards Goytshead Farm, rather than Goytsbridge Farm which is over the bridge to the left? And why is it T Hibbert rather than Ben Hibbert, who Gerald says ran the teashop in Goyt’s Bridge? The small sign high up on the side of the Goyt’s Bridge barn in the photo above, taken in the early 1930s, intrigues me. It’s difficult to decipher, but it seems to point right; towards the tea rooms at Goytsbridge Farm. 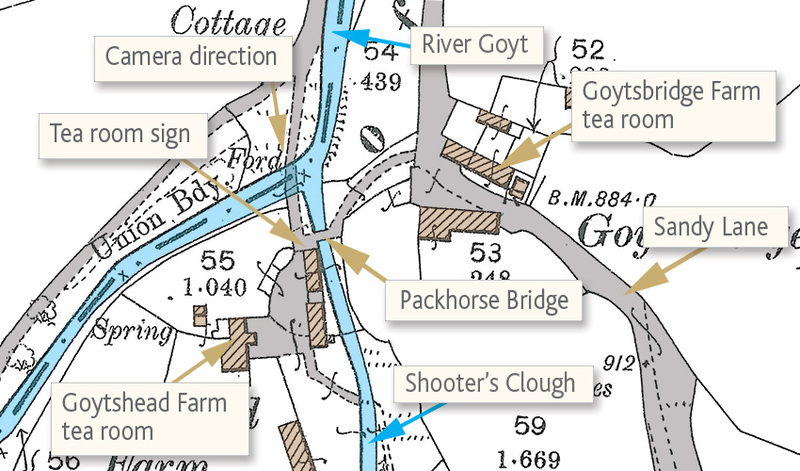 But according to my old OS maps (above; click to enlarge), the farm on the right is Goytshead Farm. So I thought I’d try searching the census records for the name on the sign – T.B. HIBBERT – to see if I can find where he lived in Goyt’s Bridge. There’s a Thomas Hibbert listed in the 1891 census as living at Errwood Hall: Born in 1871 in Buxton; a servant with the occupation of ‘general labourer’. And another Thomas Hibbert appears in the 1911 census as living at Black Hill Gate Farm, Taxal, with the occupation ‘cartridge rapper at gunpowder mills’. He lived here with his three brothers and two sisters until sometime between 1901 and 1911 when he moved into Goyt’s Bridge with his wife, Martha, daughter, Frances, and servant, Hanah Skidmore. But unfortunately there’s no record of where he moved to. The only clue we have is that the census records it had six rooms and was large enough to accommodate a servant (see below – click to enlarge). The Hibberts had a long association with the valley and Errwood Hall, and were among some of the last families to live there. Tommy Hibbert had Bunsal Farm, his parents’ home, while Ben Hibbert who was also a gamekeeper on the estate, ran Goyt’s Bridge Farm, where they also served teas. Years later Ben Hibbert would tell his grandchildren when they had Americans for breakfast, that they always put marmalade on their eggs and bacon. This caused him great amusement, and he often told the tale. While over at Bunsal Farm, Prudence Hibbert was well known for her baking skills, fruit cake and parkin being her speciality. It’s at this point that things start to become more than a little confusing. Why is it that the sign seems to show that the tea room belonged to Tommy rather than Ben? Also, I can’t find any census entries for Ben Hibbert. But there is one for Prudence. 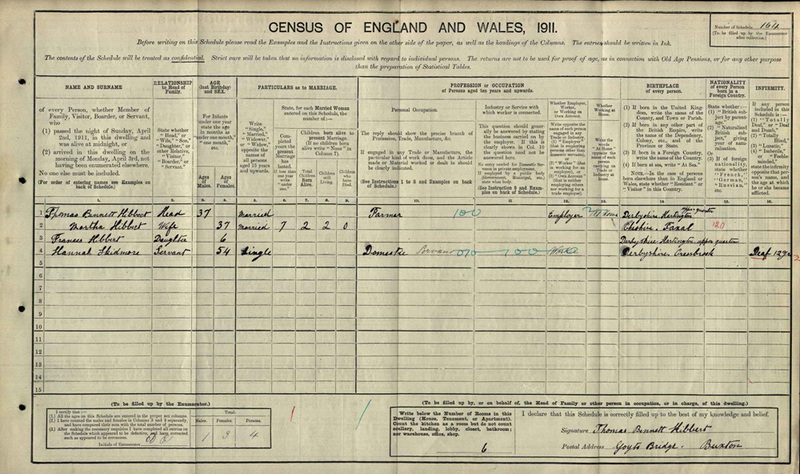 Prudence is listed in the 1911 census as living in Black Hill Gate Farm, Taxal; the 37-year-old wife of Joe and mother of Thomas. But this isn’t our Thomas B. Hibbert. This is the cartridge rapper (I’m guessing it should read wrapper!) employed at the gunpowder mills. 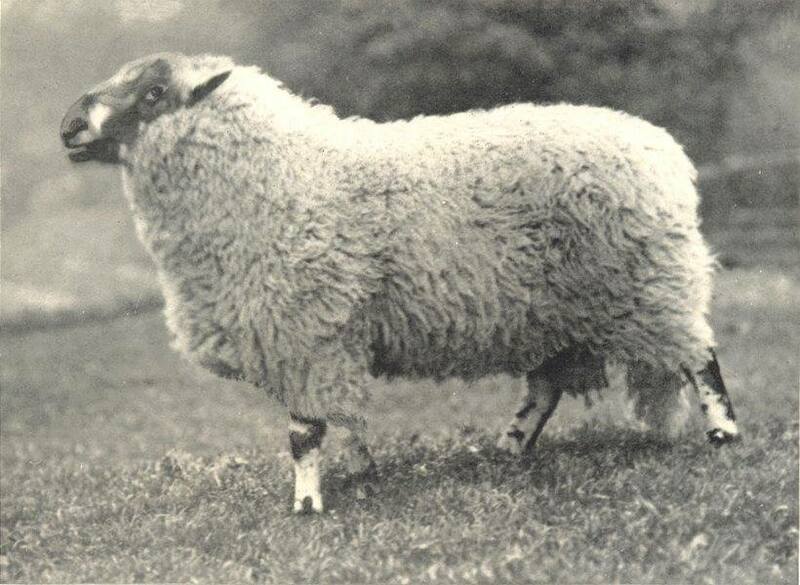 Perhaps Prudence moved into Bunsal Farm after our T.B.Hibbert had moved to Goyt’s Bridge in the early 1900s. Or maybe the first-hand accounts Gerald relied on were less than accurate – after all, memories stretching back so far can be unreliable. All I know is that I don’t seem any closer to solving the riddle of the tea room sign! Maybe it’s not an arrow pointing to the right. Or maybe it reads Goyts Head rather than Goyts Bridge. One day I’m hoping to find a clearer image of the sign. If you find one, please do get in touch. I think this piece about the Hibbert family is fascinating as my dad was a Hibbert and these were his uncles and aunts. Do you have any more information? I don’t have any more info, Joan, but maybe someone else will comment. The Hibberts certainly seem to have had a long association with the valley. David. All the Hibberts mentioned are related to me, if distantly. My 3x great grandfather, JOHN HIBBERT, died at Long Hill Farm in 1850 and his wife, Mary, died 1880. Their son, WILLIAM COTTRIL HIBBERT, was born 1825 and later lived in Garden House, Tongue Lane. I am trying to find more about Daniel Hibbert and his wife, Martha, who lived in Goitshead and their children were baptised at Hartington 1733-1743. I would love to hear from any other Hibbert researchers. The 1939 Register shows Joe Hibbert born 13 March 1869 and Prudence born 8 Aug 1874 at Cotes Field Hartington, with Thomas B. Hibbert 16 May 1895 and James G Hibbert 11 May 1923. I have an old newspaper cutting – no date – about the flooding of the valley. It interviews Joe and Prudence about their move and the fact that they have had an offer to go to Parsley Hey. Joe says “They aren’t human folks, Corporations”. Click here to read the newspaper article. It makes fascinating reading.